On Tuesday, September 2nd, Sanborn opened the season with the 35th anniversary of the Jamie Martin Invitational. Traditionally a flat and fast course with the first and final 600 meters across the common in Kingston, this year’s version saw some fast times. After a delayed start due to pop up thunderstorms and heavy down pours, the event went off with the girl’s race. An early lead pack emerged by the end of the commons with Sarah Crampton of Hollis-Brookline, Laken Kerrigan of Seacoast Christian and Shaylyn Harrington of Pelham, trailed slightly by Rebecca Zylak and Liberty Gendron both of Goffstown. The race remain similar through most of the race with Kerrigan strining out the race before the 2 mile mark. This would hold to the finish, with Kerrigan for the win in 20:21, Crampton in the runner up position, Harrigton making the podium, and with the dou form Goffstown in the fourth and fifth positions. H-B won this one handily, for the second year in a row, 42 to 71 over Goffstown. However the score doesn’t reflect H-B’s dominance. H-B’s fifth runner was ahead of every teams fourth runner, and their six and seven were better than anyone’s fifth, and they had 8 girls in the top 25. 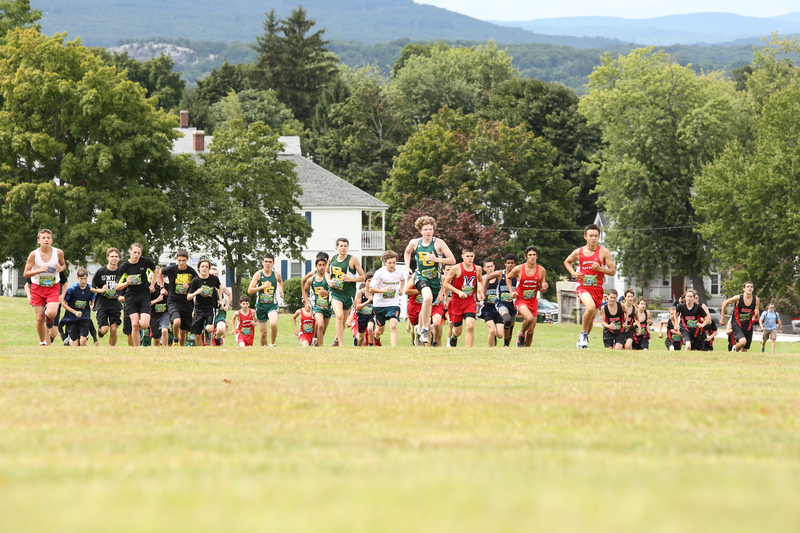 ConVal took the third spot, Gilford in fourth, and Pelham rounded out the top five teams. The boys race got off to a fast start when Ryan LaFrance of Gilford, Tim Fafard of Mascenic, Sean Munelly of Campbell, Hunter Miller of Kingswood and a host of others hammered down the town commons. At the mile the lead pack had thinned to single file, with LaFrance leading last year’s winner, Fafard and Miller. There was a small gap back to the chase pack and then the rest of the field. However things would change on the way back. By two miles LaFrance had gapped Fafard, and Avery Traffie of Mascenic was closing hard in third. The trio would finish that way, with LaFrance winning in 16:34, matching Fafard’s winning time from last year. Cody Murphy of Goffstown and Ehsun Farooq of Manchester West would finish fourth and fifth. Mascenic was able move up two spots from last year, with a win over Goffstown, mostly on the strength of their supporting runners. Returning athletes averaged a 70 second improvement over last year elevating the teams profile big time. And while the points spread appears similar to the H-B girls (26 points instead of 29) this race seemed much closer. Mascenic put 4 athletes in the top 25, with their 5th taking 32nd. Kingswood held down third, H-B took fourth and Pelham mirrored the girl’s performance finishing fifth.